Steven Rinella hosts the television series Meat Eater, an hunting show airing on the Outdoor Channel every Monday at 8:00 pm. He hunts for the right reason. Many hunters kill animals so they can hang a trophy on the wall. Others (more than any pro-hunting organization would ever admit) simply like to kill animals for the hell of it. On an episode of one of Anthony Bourdain’s television series the host went hunting with a bunch of duck hunters who didn’t like the taste of duck. Mr. Bourdain, an accomplished chef, changed their minds when he showed them how to correctly cook the birds. But still, I don’t get it. Why did all those men go duck hunting, if they didn’t like to eat duck? Mr. Rinella is not like that at all. Most Meat Eater episodes show him cooking and eating whatever animal he killed for that week’s show. 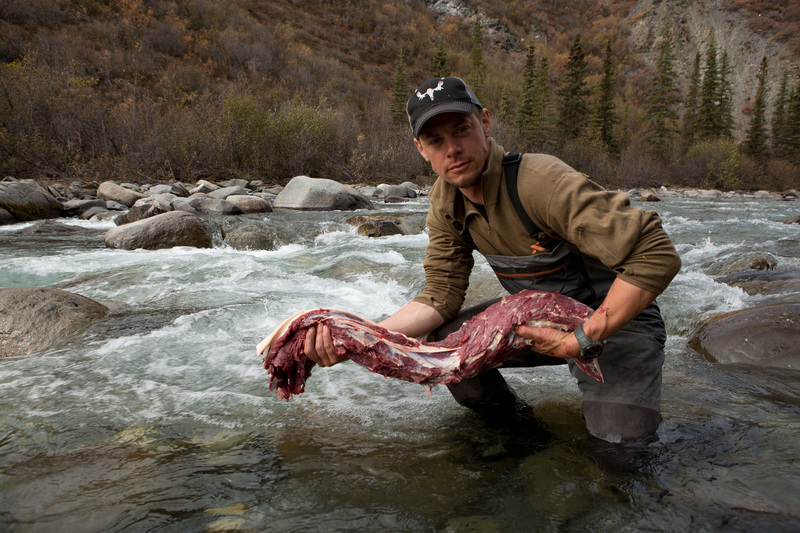 Steve Rinella, host of the tv series Meat Eater. 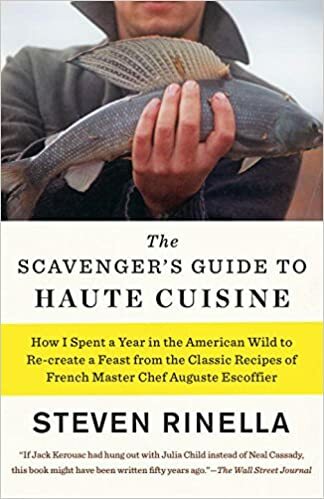 Mr. Rinella first published an interesting and well written book about 10 years ago entitled The Scavenger’s Guide to Haute Cuisine. The book is about his year long quest to produce a 45 course 3 day feast of recipes from a century old cookbook authored by the famous French chef Auguste Escoffier. Many of the recipes used animals once popular but not commonly consumed today. He caught stingray off the Atlantic Coast, trapped house sparrows and pigeons in the inner city, hunted wild pig in California, and helped an eel fisherman gather eels from his weir in Delaware. He discovered he no longer enjoyed gigging for bullfrogs in Michigan. Although this was an activity he enjoyed as a child, he admitted it grossed him out as an adult. The frogs he killed for the feast would be his last because he decided to retire from frog-gigging. Of course, he hunted bear, elk, mountain goat, and pronghorn out west–the main guest stars of his current television series. Mr. Rinella’s book is interesting and well-written. My favorite chapter in the book was about his trip to coastal Alaska when he had the opportunity to fish for halibut. I know I will never have a chance to visit this region and see all that wilderness and rich marine life. By reading about his experience, I at least enjoyed some vicarious satisfaction. Ironically, Mr. Rinella’s girlfriend at the time was a Jewish vegetarian. He successfully converted her into a fish and shellfish eater but his feast of headcheese, pigeon cooked in pronghorn bladder, crayfish mousse, and 11 other old-fashioned dishes made her sick. Most of the dishes he served at his Thanksgiving weekend feast of 45 courses were hits but there were misses as well. I suppose his guests were friends close enough to give him their honest opinions. I own a copy of Escoffier’s cookbook, but I rarely use it. The book has over a thousand recipes, mostly consisting of various fancy ways to decorate a plate. I am more of a blue plate special kind of cook and eater–hamburger steak and gravy, mashed potatoes, chili con carne, smothered pork chops, chicken and sausage jambalaya, stuffed cabbage, Greek salad, pumpkin pie, blueberry cobbler, etc. Good food makes presentation irrelevant. Escoffier doesn’t inspire me, but I’m glad it inspired Mr. Rinella to take on this project and write a book about it. I concede Escoffier’s book is a decent primer on cooking technique. It has helped Mr. Rinella become a really good cook. Just look at all these delicious recipes posted on his website. Mr. Rinella shares my disdain for the euphemism of the word, harvest, as a substitute for kill. It always irks me when hunters say they are harvesting an animal. Harvesting means a person is picking an apple or an ear of corn. If an animal isn’t killed instantly, I’m sure the bullet or arrow piercing its nerves and flesh hurts a lot. Hunting is killing, not harvesting. Hunters who use the word, harvest, are dishonestly sanitizing what they do. I’ve taken some flack for my opinion about this, but at least 1 person agrees with me. The Chimney Top is a series of dry rocky ridges located in the Great Smoky Mountains National Park where slate, schist, and phylite overlay erosion-resistant sandstone. In some places precipitation has eroded away the top rocks, exposing the sandstone, and the formations resemble chimney tops, hence the name. Last November, 2 unnamed juveniles set the surrounding forest on fire. Drought conditions fed the fire, and it was fanned by 80 mph mountain wave winds. Hot air from the fire rose up the mountain and when it met stable air, it ricocheted and accelerated downward in waves. The fire burned over 15 square miles and spread into neighboring Gatlinburg, Tennessee, killing 16 people, 2 black bears, and uncounted small animals. Yet, this forest will recover because many of the plant species growing on the ridge are well adapted to fire and in some cases even dependent upon it. Needles and cone of the table mountain pine. This species depends on fire to open its cones. Fireweed also depends on fire. The Chimney Tops. Erosion resistant rock explains the chimney-like formations. Photo of a burned ridge on Chimney Top. The Chimney Top environment consists of rock chestnut oak (Quercus montana), table mountain pine (Pinus pungens), and heath balds. Rock chestnut oak is fire resistant, and it thrives in the rocky shallow soils on the ridge. Table mountain pine also grows well in the shallow soils, and it depends upon fire to open its seed cones. Although long exposure to hot sun opens table mountain pine cones, the process is best facilitated by fire. Park service employees noted a rain of pine seeds in the air a few days after the fire. In 5 years the burned over ridges will be covered with pine saplings and fireweed. Some heath balds completely burned to the ground–an unusual occurrence here because this region is the rainiest spot east of the Mississippi. 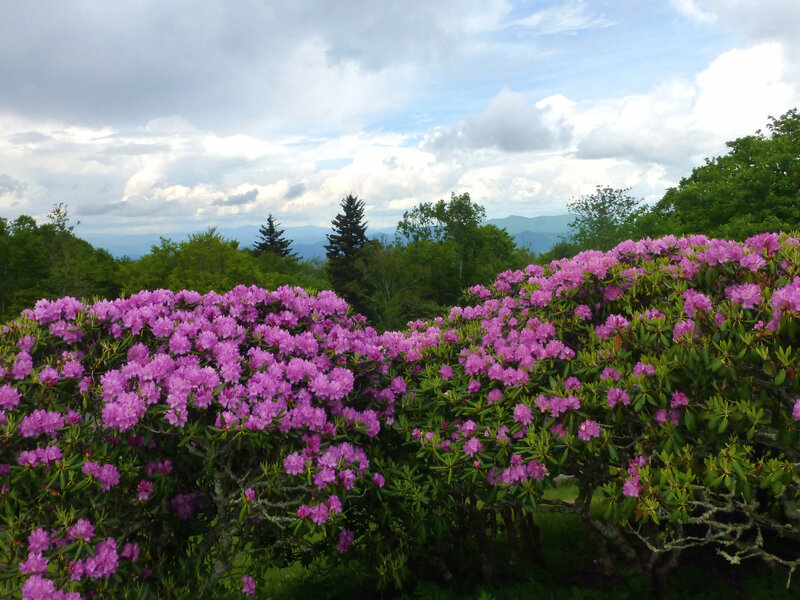 Heath balds are evergreen shrub communities consisting of mountain laurel (Kalmia latifolia), Catawba rhododendron (Rhododendron catawbiense), various species of blueberries (Vaccinium sp.) and huckleberries (Gayluccia sp. ), and 1 deciduous tree–mountain ash (Sorbus aucuparia). Heath balds are often adjacent to grassy balds and surrounded by forests of red spruce and hemlock. Heath shrubs thrive on shallow acid soils located on mountain slopes. Both heath and grassy balds are of ancient origin. (See: https://markgelbart.wordpress.com/2016/05/16/the-extinct-helmeted-musk-ox-bootherium-bombifrons-and-appalachian-grassy-balds-during-the-pleistocene/ ) Scientists studied heath balds and discovered they grow on a layer of peat underlain by charcoal. This suggests heath balds occasionally do burn completely, yet regrow in the same location. This fire gives scientists the first chance to ever witness the rebirth of a heath bald. Forests are resilient. The area in the photo below was clear cut during 1910. The original forest consisted of chestnut, oak, and hemlock; many with trunks 5 feet in diameter. The destruction of this locality spurred the creation of the Great Smoky Mountains National Park in 1926. The 2nd growth forest that replaced the original tract is not as impressive but at least it is green. This area was clear cut in 1910. It has nicely recovered but is not as impressive as it was originally. Most of the Great Smoky Mountains National Park is heavily wooded, and wildlife usually stays hidden in thick vegetation. Cades Cove is 1 of the few areas in the park where tourists can reliably see wildlife because it is an open beautiful valley of fields and thin fingers of forest, resembling what many southeastern landscapes looked like until the mid-19th century. Indians set fire to the valley annually to improve habitat for game animals, and white settlers maintained the open nature of the valley by using it as pasture and by planting row crops. The valley remained open when the National Park Service took over the site 90 years ago. Today, a 1-way loop road encircles the valley, making for the best accessible wildlife watching in the park. I rode my car on the Cades Cove loop road last Saturday evening with my wife and daughter. We saw >50 horses, 20 deer, 2 black bears, 1 squirrel, 1 turkey, and lots of crows and chimney swifts. The herd of tame horses is located near the beginning of the loop road. Many different breeds are represented including spotted palominos, Clydesdales, and solid black and brown horses. I saw cowbirds foraging between the horses. Fossil evidence shows horses did inhabit this region during the Pleistocene. I would like to see the park service allow horses to go wild here. Wild horses belong in North America. There’s an herd of over 50 horses near the entrance to the Cades Cove loop road. Black bear sightings caused several traffic jams on the loop road. There are hundreds of signs telling tourists to pull over when they want to stop and see the wildlife, and other signs constantly warn to stay at least 50 yards away from bears and deer. Most tourists ignore these signs. They stop their cars in the middle of the road, rush toward the bear, and get as close as they can to photograph the bruin. We were stuck in 1 traffic jam for 20 minutes. At least I did get to see wild black bears for the first time in my life. I’d rather live in a world where bears outnumber people. It has been thousands of years since bears outnumbered the entire population of Homo sapiens on earth but before the development of agriculture they did. We saw 20 deer. This buck snuck behind me. This was the only turkey I saw in Cades Cove. I expected to see more. While driving through the park the following day I saw an hen with 2 chicks cross the road. Why did the turkey cross the road? There are 4 deer in this photo. 2 are laying down but their antlers are visible. This was the only live squirrel I saw in Great Smoky Mountains National Park. I was surprised I didn’t see more. We saw 2 black bears on the Cades Cove loop road. Look at how close these 2 stupid asses got to the bear. They are underestimating how dangerous this situation is. There must be at least 100 signs telling people to stay at least 50 yards away from the bears and deer. Instead, people rush in and try to get as close as possible to take a photo. That bear could be mauling them in about 2 seconds. These are the rare and extirpated species that used to live in the Great Smoky Mountains National Park. Spotted skunks are rare, Indiana bats are endangered, northern flying squirrels are probably extirpated here, fox squirrels haven’t been seen for decades in the park, and northern water shrews are uncommon. I was surprised I didn’t see more turkeys or squirrels. The latter probably stay in the tree tops for much of the day. I also expected to see woodchucks, rabbits, and maybe wild boars. Woodchucks are more active in the morning, and I did see 4 of them while driving through the North Carolina mountains on the way home the following day. I can’t explain the absence of rabbits because there is plenty of excellent habitat for them in Cades Cove. Perhaps they were hidden in the tall grass. Ironically, I saw a road-killed wild pig 5 miles from my house on the drive home the next day as if the wildlife watching Gods wanted to reward me with a kind of epilogue to my trip. Despite how common wild pigs are supposed to be, this was the first road-killed specimen I’ve seen in the Augusta, Georgia area. The National Park Service should introduce bison, elk, and cougars to Cades Cove. I know the addition of cougars would be controversial, but the park service should be inspired to come as close to possible to establishing a complete ecosystem here. More open areas should be created as well so that wildlife populations could increase. The National Park Service should introduce bison and elk to this side of the park to fill up this empty space. Bird watching at Cades Cove was not as good as in Townsend, Tennessee where our hotel was located. I saw 5 species of birds in Cades Cove compared to 11 species in town. However, I did encounter 1 unexpected species outside of Cades Cove but inside Great Smoky Mountains National Park. I saw a raven while driving in the higher elevations, then saw another raven on the way to Cades Cove at a lower elevation. This was the first time I’d ever seen live ravens in the wild. I mistakenly thought ravens were rare here because there is only 1 raven nesting site in the entire state of Georgia. But according to the National Park Service, the raven is a fairly common year round resident in the park. Ravens look like humongous crows. The birds I saw were far too large to be crows. They were about the size of a red-shouldered hawk. Crows are more common here, however. In addition to the 5 species of birds I saw at Cades Cove, I heard the constant song of the field sparrow. Eastern meadowlarks are also supposed to be common here, but I didn’t see any. I have never seen an eastern meadowlark. Night fell by the time we left the Cades Cove loop road. I was surprised at the abundance of lightning bugs. Special tour buses take tourists through the park at night to see the amazing light show displayed by the synchronous firefly (Photinus carolinus) during late May and early June. We probably saw some of the other 18 species of lightning bugs found in the park because it was too late in the season for P. carolinus. Lightning bugs are not bugs, nor are they flies. They are beetles. Their larva prey upon snails, slugs, and insects for a year or 2 before they transform into flying adults for the final few weeks of their lives. Different species flash at different intervals and that is how males and females of the same species recognize each other. Lightning bugs are only seen occasionally in Augusta, Georgia. They are abundant in the Great Smoky Mountains because the moist forests support a large population of their favorite food–escargot. Video from you tube of the synchronous fireflies. Larry Martin is the paleontologist who invented the fanciful name of “cookie cutter cat” for this extinct species. He proposed this big carnivore killed its prey by taking a bite and retreating, thereby removing a piece of flesh like a cookie cutter removes a section of dough. Supposedly, the cat then waited around for its victim to die from the wound. I don’t buy it. It seems unlikely a predator would cease attacking a wounded animal. Instead, I believe this powerfully built animal held its prey down with its sturdy forelimbs and bit through the throat. I suspect this is how all species of fanged cats dispatched their prey. The cookie cutter cat is a newly recognized species. Though commercial fossil collectors discovered 2 nearly complete skeletons at the Haile fossil site in 1981, scientists didn’t identify it as a new species until 20 years later. At first scientists assumed it was a scimitar-toothed cat (Dinobastis serus) based on skull and dentition. There were 2 lines of fanged cats during the Pleistocene in North America–the scimitar-tooths or Homotheridae and the saber-tooths or Smilodontheridae. Both belonged to the subfamily Machairodontinae. Scimitar-tooths were previously known to be long-limbed and built for chasing down prey, while saber-tooths were robust and built for ambushing their victims. However, paleontologists eventually realized the cookie cutter cat was an exception. It was a scimitar-tooth cat built for ambushing its prey, like the saber-tooth line of cats. Cookie cutter cats were robust and powerful and short-limbed. Mounted skeleton of the extinct cookie cutter cat. It was stout like a bear and about the size of a lion. Fossils of cookie cutter cats have been found at 7 sites in Florida including Haile, Sarasota, Citrus County, Levy County, Santa Fe River, Hillsborough, and Marion County. Specimens identified as belonging to the Xenosmilus genus have also been found in Arizona and Uruguay. Cookie cutter cats are known to have lived during the late Pliocene and early Pleistocene between 2.5 million years BP-1.5 million years BP. The specimens at Haile were associated with many bones of peccaries, a likely prey item. Pleistocene ecosystems supported a great variety of large predators. During the early Pleistocene the saber-toothed cat (Smilodon gracilis, ancestor of S. fatalis) and Edward’s wolf (Canis edwardii, possible ancestor of C. dirus) were 2 important carnivores that kept herbivore populations in check. 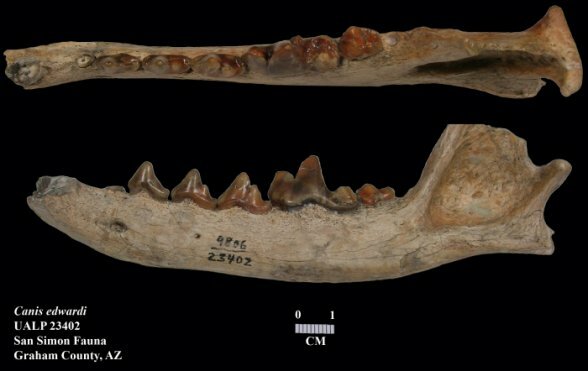 A study analyzed the chemistry of megafauna bones from 2 early Pleistocene-aged sites in Florida to determine what these 2 predators chose to prey upon. The study included data from 110 specimens of 12 species excavated from Leisey Shell Pit, and 51 specimens of 9 species found at Inglis 1A. Species used from Leisey Shell Pit in addition to the 2 carnivores mentioned above included mammoth, mastodon, gompothere, horse, 2 kinds of llama, 2 kinds of peccaries, white tail deer, and tapir. Subfossil remains from this site date to between 1.5 million years BP-1.1 million years BP during an interglacial climate phase when the environment is thought to have been lowland forest and swamp, though there must have been some grassland. Species used from Inglis 1A were mastodon, white-tail deer, peccary, tapir, horse, llama, and an extinct species of pronghorn along with Smilodon and Edward’s wolf. Subfossil remains from Inglis 1A date to between 1.9 million years BP-1.6 million years BP during a glacial climate phase when the environment is thought to have been a mix of longleaf pine savannah, oak scrub, and forest. Jaw bone of the extinct Edward’s wolf, 1 of the oldest wolf species known to have lived in North America. 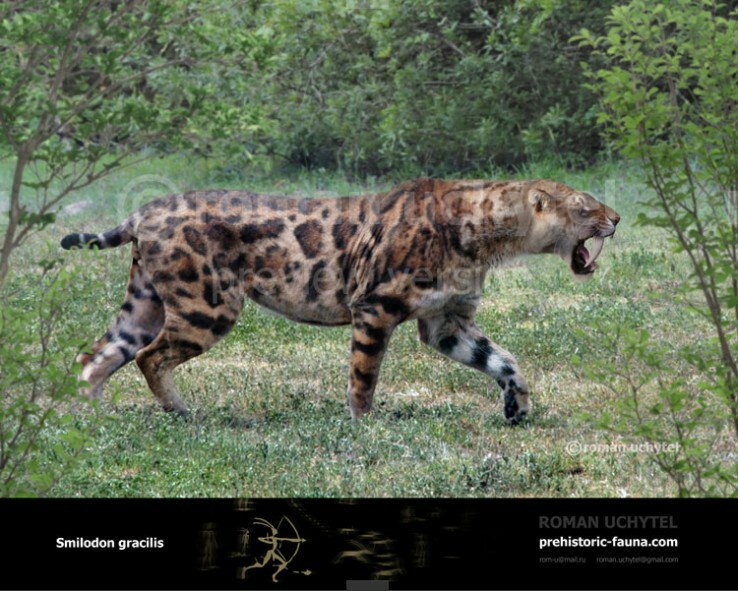 Photoshopped Smilodon gracilis, the evolutionary ancestor of the late Pleistocene Smilodon fatalis. The results of the study indicate Edward’s wolf ate a greater variety of prey than Smilodon, but both species were adaptable to changing environments. During the interglacial period Smilodon ate herbivores that fed in forest environments (mastodon, deer, tapir, paleollama), while wolves mostly ate grassland herbivores (mammoth, horse). However, during glacial periods when grasslands predominated Smilodon adapted by eating more grassland herbivores. Choice of prey among individual saber-toothed cats varied. Some individual cats ate nothing but forest herbivores, while others ate just grassland herbivores. I think this shows saber-tooths were territorial animals that stayed in the same home range their entire life. They ate whatever prey occurred within their established territory. Herbivores that fed in both forest and grassland (large-headed llamas, gompotheres, peccaries) likely fell prey to both carnivores. WordPress has a feature that lets me see how many daily views my blog articles get. For several years my article entitled “Bearzilla: the Biggest Bear Ever” is almost always the single highest viewed article of the day. 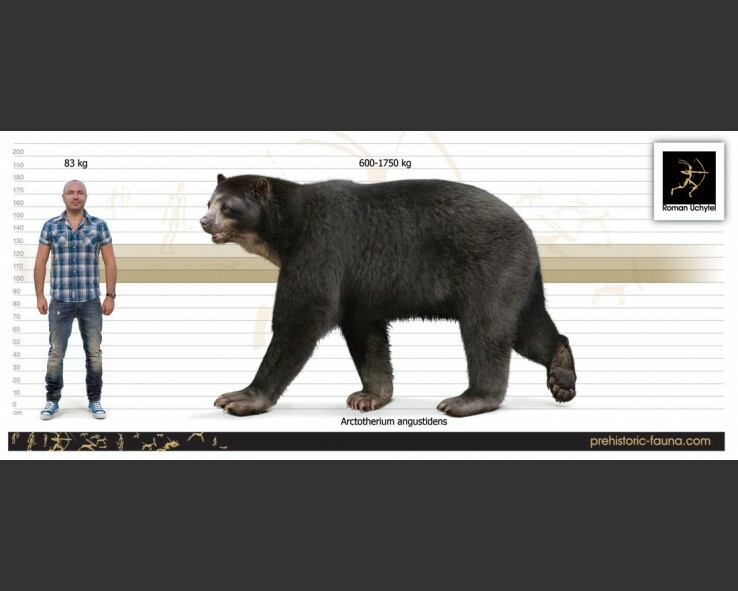 https://markgelbart.wordpress.com/2012/12/10/bearzilla-the-biggest-bear-in-history/ The subject of that popular blog entry is Arctotherium angustidens, an extinct South American species of bear that reached estimated weights of 3500 pounds–the largest size of any bear known to science. In that blog entry I also discuss the largest specimens of extant species of bears and include a photo I ripped off from google images of a 2100 pound polar bear. I suspect that photo is what draws so many views. I came across a fairly recent research paper in the Journal of Paleontology about A. angustidens with enough information for me to write an addendum to my original article. Illustration showing the early Pleistocene giant short-faced bear that lived in South America. It later evolved into a smaller more herbivorous species. Scientists studied the pathology, morphology, chemical signatures, and biomechanics of A. angustidens bones to determine what this species ate. Missing, broken, and worn teeth were common. The evidence of these dental problems suggests the bears were damaging their teeth when they clumsily gnawed on bones. Some bear teeth even had bone splinters lodged in them. An individual young female bear had a tooth infection caused by a bone splinter in its tooth, and this was the probable cause of death. These giant bears had large teeth cheek similar to the extant giant panda (Ailuropoda melanoleuca), but pandas don’t exhibit tooth damage on their diet of bamboo. The frequent occurrence of tooth damage in Arctotherium can only be explained by a diet high in bone consumption. 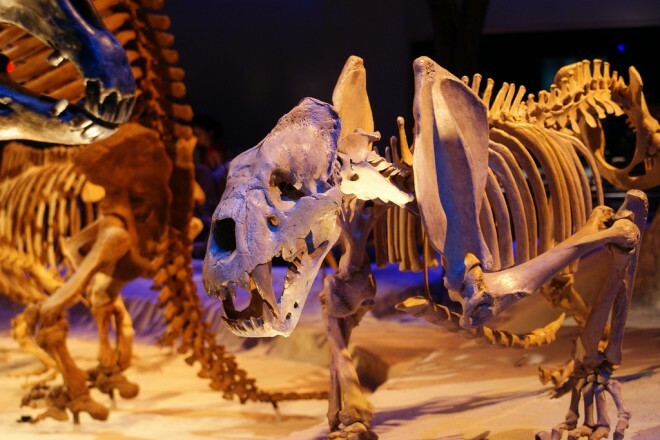 An analysis of stable isotope ratios in Arctotherium bones does suggest this species included lots of meat in its diet, but it also ate plant material. The scientists conclude Arctotherium was an omnivore. When large bears first colonized South America they competed with just a few large carnivores such as saber-tooth cats. There was an abundance of large slow-moving prey the bears could wrestle down. Eventually, more species of predators colonized the continent, and some prey species evolved into faster runners. Other prey species–the large ground sloths for example–may have evolved into stronger adversaries as well. Bears that consumed more plant material had a better chance of surviving than those that competed with predators or failed to obtain prey. This may be why Arctotherium’s descendants evolved to eat more plants than meat. You are currently browsing the GeorgiaBeforePeople blog archives for June, 2017.